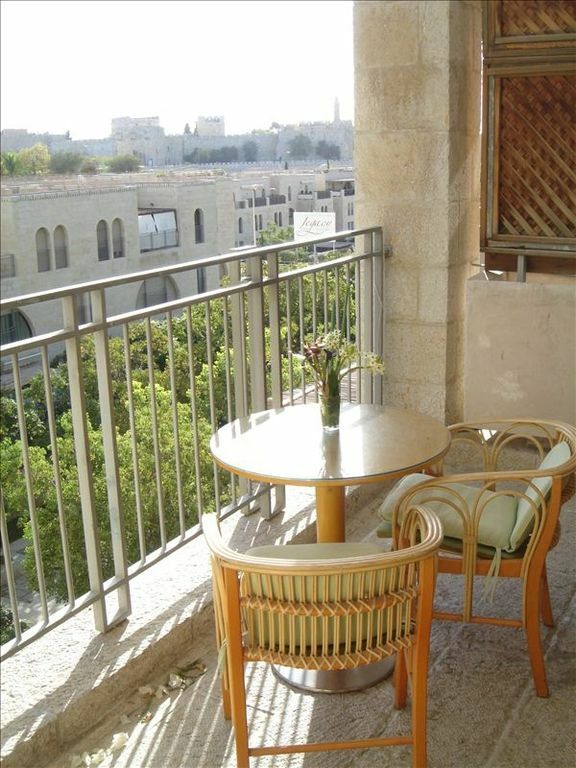 Magnifique appartement dans le coeur de Jérusalem. Situé dans le même complexe que l'hôtel David Citadel, au cœur du quartier des hôtels de luxe, vous êtes à seulement quelques minutes à pied de la vieille ville ou de la célèbre zone commerçante de Mamila. Trois chambres ont leur propre salle de bain adjacente (chambres des maîtres) ce qui rend l'appartement parfait pour les familles / couples de partager l'appartement. Chaque chambre est meublée avec un placard spacieux et généreux tiroir et étagère. L'appartement est situé dans une rue calme qui vous donne l'impression d'être dans une oasis de calme et de confort au milieu de Jérusalem. Installé sur deux étages, vous avez une distinction confortable entre la zone de la chambre (étage inférieur) et le salon spacieux et la cuisine (étage supérieur). Le grand salon est équipé de la télévision par satellite, d'une connexion Wi-Fi et de la table à manger pour 12 personnes. Il y a une salle d'eau séparée pour les invités. Devant le salon se trouve une grande terrasse qui vous offre une vue à couper le souffle sur les murs de la vieille ville et sur la piscine de l'hôtel David. La cuisine pratique contient un réfrigérateur, congélateur, cuisinière vitrocéramique, four, micro-ondes, bouilloire électrique et machine à café. La cuisine doit être gardée strictement casher: Pour les ensembles de vaisselle et de couverts, une plaque de Shabbat et une cuisinière à eau sont fournis. * Une chambre à l'étage supérieur avec des lits jumeaux merveilleusement confortables et deux lits escamotables - avec une douche et des toilettes adjacentes. * Deuxième chambre principale avec lits jumeaux et un lit gigogne supplémentaire (totalement 4 lits). Jacuzzi avec douche. * Chambre avec lits jumeaux et deux lits escamotables - avec toilettes adjacentes. A l'étage inférieur est une autre salle de bain avec WC. Un lave-linge et sèche-linge, sèche-cheveux et fer à repasser sont à votre disposition. Une place de stationnement dans le parking David Citadel vous est réservée. Et pour votre confort: Les services de l'hôtel Citadel sont disponibles en supplément (par exemple piscine 120 - 190 ILS, salle de gym 100 ILS, nettoyage). Il y a des images supplémentaires disponibles. Mots-clés: Au David Citadel Hôtel - Walk to Old City - Appartement de luxe. Idéal pour les groupes / familles qui veulent passer du temps ensemble mais ont néanmoins leur vie privée. Yael was wonderful to deal with and our family had a fantastic time staying in the heart of Jerusalem! It was amazing to be just a short walk away from the kotel. The apartment was very spacious, clean and comfortable! We would certainly stay here again! Wonderful apartment with lots of beds and is in the most central, perfect location. This apartment is great for large families. Yael was a pleasure to work with and I look forward to staying on our next trip to Israel. It was a pleasure to host you - and looking forward to have you back! Better than advertised - this place is great! The layout is a little different as the main floor has the bedrooms, while the upstairs has the kitchen/living room. Both floors have decent size porches with spectacular views. All of the basics were provided including linen, towels, toilet paper, soap, shampoo, etc. We did need to restock as we were there for almost 2 weeks, but that is to be expected. Yael even arranged for cleaning help (at an additional cost, but well worth it). Yael was amazing to work with. Very responsive via email and whatsapp prior to and during our vacation. She met us at the property and was so nice and helpful. We didn't have any issues at all during our stay. Overall this is an incredible deal and I would rent again in a hearbeat. My brother's family came with us and stayed next door at the David Citadel hotel. They literally paid 3 times as much as us (for about a quarter of the space), and by the end of the trip were regretting their decision. Thanks, Yael, and we hope to be back again soon! I chaperoned a trip of 10 American high school students touring Israel. We spent our first week in the new wing of the Karei Deshe youth hostel on the Sea of Galilee and the second in Jerusalem. I've stayed in a VRBO/Airbnb just outside the Old City previously- nothing compares to the convenience of this location. For all intents and purposes, it's located at the entrance to the Mamilla Mall. This makes for excellent dinner and morning coffee options (nothing like a morning espresso overlooking the Old City). If you're eating in, which we did for breakfast and several evening meals, a full service grocery store (including gluten free options) is a block and a half away. Although we didn't have a need to call Yael, except for an extra parking pass, she was helpful and stopped by to check on our stay. She very quickly and fully refunded our security deposit. The only negative comment about the unit itself, has to do with the heat in the 2nd floor bedroom. We couldn't figure out how to shut off the radiant floor heat. It got mighty warm. I'm sure Yael would have corrected this for us if we had called, but we were so busy while there that we never took the time to notify her. Speaking of parking- only one pass comes with the rental, so if you need a second, notify Yael. She indicated that there would be an additional parking charge, but ended-up not charging us of for the second pass (thanks, Yael). Parking can be a little confusing to the uninitiated, so again, get specific instructions before arriving. Also, we needed to leave for Tel Aviv at 2:00 a.m. on our last day. Fortunately, we noticed that the garage is locked for the evening and doesn't open until well after 2:00 a.m.. Street-side parking is at a premium, so you may want to use the paid parking lot around the corner if you need to leave before the garage opens. The unit was clean and moderately well equipped. The A/C worked well. Beds were comfortable. There was plenty of common area seating for our group of 15. The kids spent hours on the porch overlooking the pool and playing cards. In spite of the heat, we did not use the pool as to do so would have been quite costly. In short, we return to Jerusalem bi-annually and will absolutely make this our number one selection. Finding an apartment for 15 is challenging. The apartment met our needs in every respect. This Place, the Location, and the Owner are SUPER! I recommend this rental as highly as possible! Yael is fantastic to deal with. Our flight arrived at 5am, so she had arranged for us to pick up the key. In my sleepy fog, I couldn't figure out how to get into the unit, so I texted her through WhatsApp. I thought my family was going to have to wait somewhere for hours until she woke up. She responded within the minute and clarified what I was doing wrong, so we could enter easily with no problems. All week she was accessible and an absolute delight to deal with. The place was clean, beautiful, and in the BEST location. It's across the street from a beautiful outdoor mall, which one can stroll for five minutes through to reach the Old City. There's a food store that's open 24/7 also across the street. Parking is indoors and easily accessible. The unit is spacious and very comfortable with so many beds and bathrooms! We loved the upstairs / downstairs layout of it as well, since three of the four bedrooms are on a different floor than the kitchen and living room area, people can easily sleep at different times undisturbed while others eat and talk. The view of the city and the adjacent hotel's pool were right outside the balcony. What was striking to me was the number of Americans we saw staying at the very fancy hotel attached to the property. The location is ideal for people having a B'Nai Mitzvah at the Wall, so we saw several families... all paying so much more money for a hotel room that's such a smaller amount of space. If you're coming with a family - stay here! Dear J. It was my pleasure to have you as our guests! All was very nicely prepared when we arrived. Everything was clean and in working order. Yael and her husband were very friendly and helpful. This location is great and has an astonishing view. I can only recommend this apartment.